Her presentation will include details about her newest Chloe mystery, The Lacemaker's Secret, which is set in 1983 at Green Bay's Heritage Hill State Historical Park and amongst the Belgian-American communities of southern Door County, WI. The book also includes an historic thread that starts in 1848 in the Kingdom of Belgium, and continues from 1854 through 1919 in Door County. The historic story focuses on the struggles of a Belgian lacemaker and her family to survive cholera, famine, our Civil War, the Great Fire, and World War I to establish themselves in America. Kathleen will also talk about how her years at Old World Wisconsin influenced her Chloe character, how her research into police work helped shape Roelke, and how she researches and writes their stories. This hour-long program starts at 6 PM, Thursday, November 1st, at the DeForest Public Library, and is free and open to the public. Afterwards Kathleen will answer questions, give away door prizes, and sign her books (copies of which will be available for purchase). In addition to mysteries, Kathleen writes historical fiction and non-fiction for adults and young readers. Her work has earned numerous honors, including an Emmy, a LOVEY Best Traditional Mystery Award, an Anne Powers Prize for Best Fiction Book from the Council for Wisconsin Writers, and nominations for an Edgar Allan Poe and multiple Agatha Christie mystery awards. To date readers have purchased over 1.7 million copies of Kathleen's now thirty-seven published books. Her presentation will include details about her newest Chloe mystery, The Lacemaker's Secret. It is set in 1983 at Green Bay's Heritage Hill State Historical Park, and amongst the Belgian-American communities of southern Door County, WI. There is also an historic thread that starts in 1848 in the Kingdom of Belgium, and continues from 1854 through 1919 in Door County. The historic story focuses on the struggles of a Belgian lacemaker and her family to survive cholera, famine, our Civil War, the Great Fire, and World War I to establish themselves in America. This hour-long program starts at 2 PM, Sunday, November 4th, at the Caestecker Public Library, and is free and open to the public. Afterwards Kathleen will answer questions, give away door prizes, and sign her books (copies of which will be available for purchase). Kathleen will be away from November 5th to 12th working at an undisclosed location on her tenth Chloe Ellefson Historic Sites mystery series book, which she is under contract to deliver to publisher Midnight Ink Books for release in fall 2019. Kathleen will be unavailable during the retreat. Inquiries can be directed to her husband and business partner, Scott (AKA Mr. Ernst), who will be manning the home office daily. Fly fingers, fly Kathleen! Vesterheim is the setting for Heritage of Darkness, Kathleen's fourth Chloe Ellefson mystery. The museum is now offering public tours based on the book (and for private groups by prior arrangement). On Saturday, November 10th, the museum is holding a special Heritage Of Darkness Tour for the public from 1-4 PM. • After tour presentation, Norwegian Courtship & Betrothal Gifts, by woodworker Rebecca Hanna. The tour has a $20 per person fee. Prior registration is required. To register or ask questions, contact Karla Brown at (563) 382-9681 or kbrown@vesterheim.org. The signup deadline for this tour is November 3rd. Spoiler Alert: Read the book in advance; the ending will be revealed during the tour! NOTE: Vesterheim will hold a slightly different Heritage of Darkness tour on November 30th. On Friday, November 30th, the museum is holding a special Heritage Of Darkness Tour for the public from 2-5 PM. • After tour presentation, The Chloe Ellefson Mysteries: Behind the Scenes, by Kathleen. The tour has a $20 per person fee. Prior registration is required. To register or ask questions, contact Karla Brown at (563) 382-9681 or kbrown@vesterheim.org. NOTE: Vesterheim will hold a slightly different Heritage of Darkness tour on November 10th. Meet Kathleen Ernst, the bestselling author of the award-winning Chloe Ellefson Historic Sites mysteries and get an autographed copy of any of her nine Chloe books, including Heritage of Darkness, (set in Decorah at Vesterheim), and the just released The Lacemaker's Secret, set in Green Bay and the Belgian commuities of Door County, Wisconsin. The signing will run from 1:00 PM to 4:00 PM, Saturday, December 1st, in the museum's wonderful gift store, during Vesterheim's popular and always delightful Norwegian Christmas event. 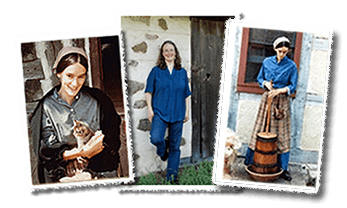 Kathleen joins fellow authors Jerry Apps and Marnie Mamminga for a special panel discussion on writing about the life and landscapes of Wisconsin and the Midwest. They'll share their thoughts with the audience on the writing process, the publishing world, and their particular works. Attendees are welcome to ask questions and participate in the discussion, and books by all of the authors will be for sale, to be signed afterward. This discussion will be moderated by Kristin Gilpatrick from the Wisconsin Historical Society Press, which is co-sponsoring the event with the 702WI Writer Incubator. This is a public program, but space is limited. Tickets may be purchased online by clicking HERE.